Traditional cuisine from the South Indian states, has a lot in common. 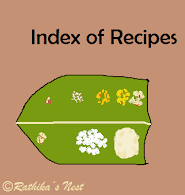 Though certain recipes are specific to one particular state or region, you may find the same recipes being used with some variations in other regions as well. The recipe gets modified with local ingredients, which infuses a new dimension to the preparation. It is not uncommon to find a traditional recipe with subtle variation being followed in families. This is one such recipe! Pesarath (பெசரத் தோசை) is a delicacy from Andra Pradesh and is traditionally made with green gram or whole moong (பச்சை பயறு). However, the recipe I have learnt is prepared with split green gram or moong dhal (பாசிப் பருப்பு). Crispy, golden brown moong dhal dosa is tasty and healthy! Give it a try. How to prepare the batter: Wash and soak rice and green gram dhal for four hours. Later grind rice and dhal with ginger and green chillies into a fine paste using the mixer-grinder. Add salt, curry leaves and cumin seeds to the batter and mix well. Please note that the batter should be of pouring consistency. How to make the dosas: Heal the tava on medium flame. Once hot, pour a big hollow ladleful of batter on the tava and spread thinly. Pour oil around the dosa. Once cooked, the edge of the dosa starts separating from the tava. Remove the dosa using a flat spoon and turn it over. Cook for a minute and then remove from the tava. Serve hot with chutney or sambar.